In an alarming tweet thread posted Saturday, Axios reporter Alexi McCammond revealed to friends and colleagues that she had been "drugged while getting drinks" at the bar of the St. Regis hotel in Washington, D.C. on Monday. 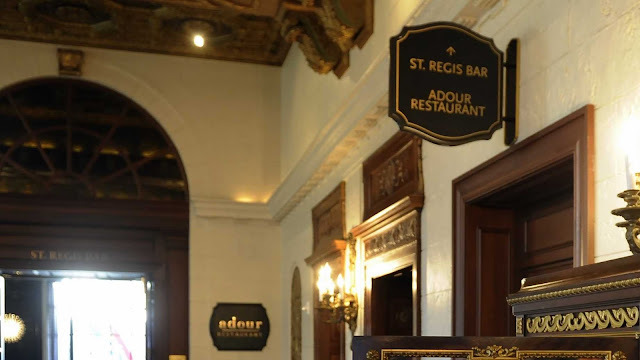 The post prompted sympathetic responses online as well as a direct response from St. Regis. "To friends/colleagues: I’m sorry for not returning so many texts/emails/calls this week. On Monday I was drugged while getting drinks at the St Regis in DC. I’m slowly recovering, but feel broken, violated, and furious. My @axios fam has been completely invaluable in this moment," McCammond wrote in the first of a series of tweets. "I hope to be back to normal next week and get back to my regularly scheduled life of traveling and covering 2020 and being a normal, happy 25-year-old. Thanks for bearing with me while I’ve been as far from my phone as possible," the reporter added. "And also while I’ve visited the ER three times this week. Please be safe while drinking and, unfortunately, be more cautious of everyone around you." To friends/colleagues: I’m sorry for not returning so many texts/emails/calls this week. On Monday I was drugged while getting drinks at the St Regis in DC. I’m slowly recovering, but feel broken, violated, and furious. My @axios fam has been completely invaluable in this moment. I hope to be back to normal next week and get back to my regularly scheduled life of traveling and covering 2020 and being a normal, happy 25-year-old. Thanks for bearing with me while I’ve been as far from my phone as possible. And also while I’ve visited the ER three times this week. Please be safe while drinking and, unfortunately, be more cautious of everyone around you. In a response noted , St. Regis Washington, D.C. asked the reporter to contact them about the incident. "@alexi we are concerned about what we read in your tweet and would like to connect with you to learn more about what happened," the hotel tweeted. "Please send us a DM." @alexi we are concerned about what we read in your tweet and would like to connect with you to learn more about what happened. Please send us a DM. McCammond also received several sympathetic responses from supporters, some of whom said they had been the victims of similar incidents. "I'm so very sorry that this happened to you Alexi," wrote one follower. "I saved the woman who is now my wife from a lowlife who had spiked her drink at a bar. I realized that she didn't seem alright and me and a buddy got her away from the jackass. Such a scary thing. Again, so glad you're ok."
"Thank you for being so aware and willing to help," wrote another. "I was drugged at a bar and was so lucky to have a male friend notice & recognize something was up. He assumed I was drunk but cared enough to get me away from the predator. I’ll never forget it." "Alexi, I’m so sorry. I know you’re strong, but there are a lot of people who care about you. Lean on them," wrote another supporter. "I am so very sorry this happened. Blanket of support waiting to surround you when you return. Pls take care," added another follower. "Alexi — I am horrified by this experience and hope you know your supportive family includes me and the viewers and readers who admire your tenacious spirit on the job. I'm keeping you in my thoughts and know your honest bravery speaking up will help you and inspire others," wrote another. I'm so very sorry that this happened to you Alexi. I saved the woman who is now my wife from a lowlife who had spiked her drink at a bar. I realized that she didn't seem alright and me and a buddy got her away from the jackass. Such a scary thing. Again, so glad you're ok. Thank you for being so aware and willing to help. I was drugged at a bar and was so lucky to have a male friend notice & recognize something was up. He assumed I was drunk but cared enough to get me away from the predator. I’ll never forget it. Alexi, I’m so sorry. I know you’re strong, but there are a lot of people who care about you. Lean on them. So sorry this happened, Alexi. Absolutely awful. Thinking about you. You are so brave and unselfish to share this @alexi. I know it will help someone else. I am so so sorry this happened to you. You know we have your back, and are with you all the way. Please take good care of yourself. McCammond responded directly to several of the posts and issued a statement on Sunday thanking everyone for reaching out. "Thank you for the kind words, everyone," she tweeted. "And special thanks to those who have reached out with their own stories of being drugged. Truly a nightmare, but hopefully we can help keep ourselves and others safer by sharing these stories." Thank you for the kind words, everyone. And special thanks to those who have reached out with their own stories of being drugged. Truly a nightmare, but hopefully we can help keep ourselves and others safer by sharing these stories.